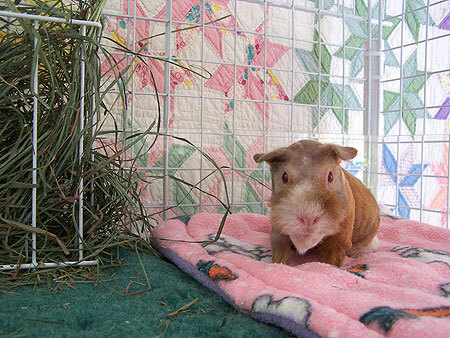 The Original Cage Blankets & More is dedicated to giving comforts to Guinea Pigs, Cavy Slaves and others since 2003. Products come along that are great, but not always in fabrics, designs, or sizes that is best for your loved ones needs. And while one product is good for the others, some may need accommodating to get it to work for you or something entirely different. That is where I can help, designing something just for your needs or just simply making something larger/smaller. Long hair, wetness problems, skinny pigs, walking difficulties, overheating, no matter the problem, I enjoy a challenge to customize to your needs at very reasonable prices that are often unmatched. 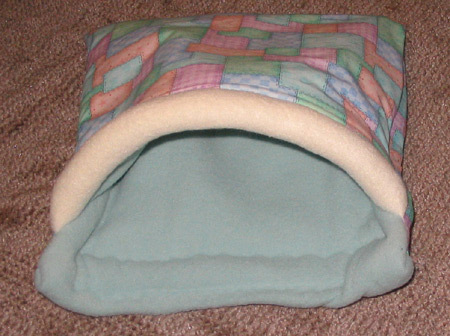 A few items in the product line includes, Cage Blankets, (Cozy) Pockets & Corner Pockets, Tunnels, Tents, Pads, Quilkets, Chiller/Warmer Bags, Pillow Pockets, Igloo's and more . 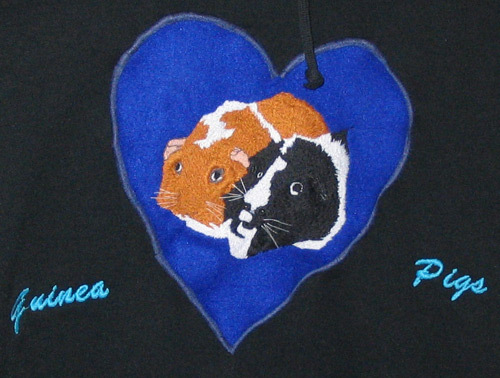 Fleece Guinea Pigs are also available. With a wide variety of products to choose from, we are always looking for another original way to help all our family members be comfy. 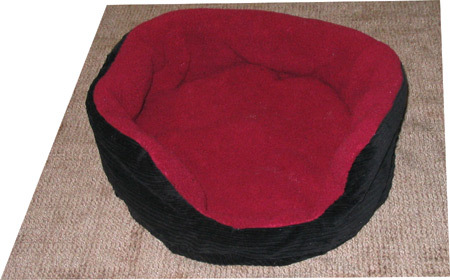 One more important fact, each item sold at regular price benefits a Rescue/Sanctuary. Any item that may be excluded is noted, such as Child's Play items made only during summer months. We’d like to give a Huge Thank You to all that has helped us past and future, with a Special Thanks to Guinea Lynx and Kleenmama’s Hay Loft. One thing I hear a lot is, "I wasn't asked to pay when I ordered." The Order Form page is very basic and many wonder why this happens. This is done for various reasons so rest assure, there is nothing you did wrong after an order is submitted and see the confirmation page. You will be contacted after your order is reviewed. A few things that are on site now and ready to send. Click the picture to be taken to it's page. Looking at your pictures does this mean you no longer make the little canopy? Lady Bug just loves hers when the weather is hot. It gives her her "cave" feeling but still lots of air. Oh, the corner pocket is really cute. It makes a piggy sandwich! I agree Snowflakey. Make the piggy look like a pita sandwich. And they hold up well. 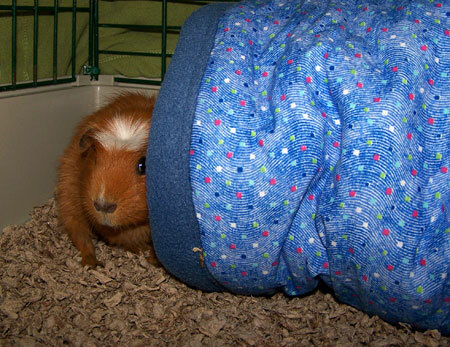 Becky, I have been meaning to send you updated pictures of the new tunnels with the piggies' new ensembles. They are absolutely perfect and match wonderfully. I need to order two more for the girls to have a change out from you soon. Here are some of the new pictures. 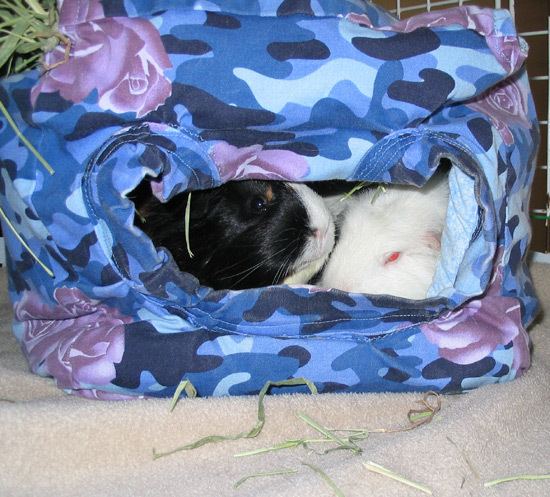 Spencer and Hopkins' cage with their tunnel. 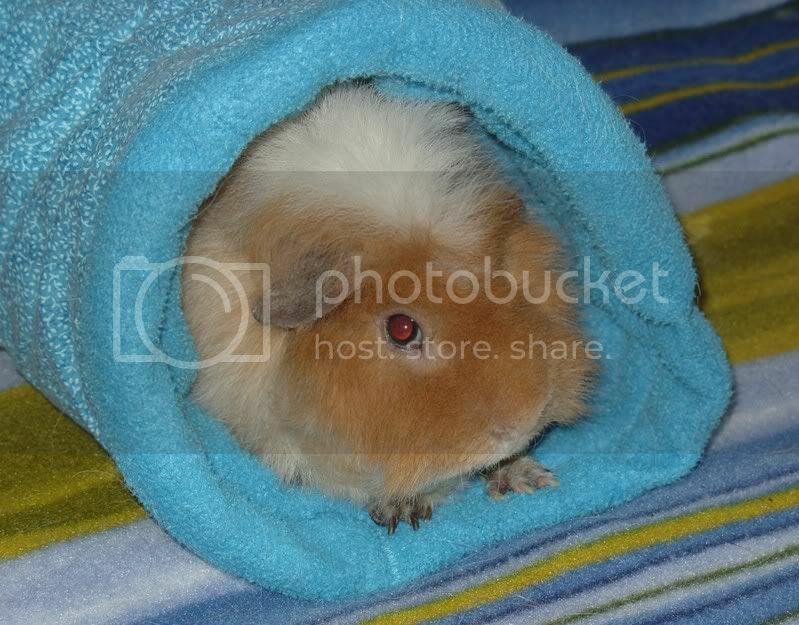 And Dudley modeling with his new tunnel. Hopkins is one of your biggest fans. Thank you for always working with me. 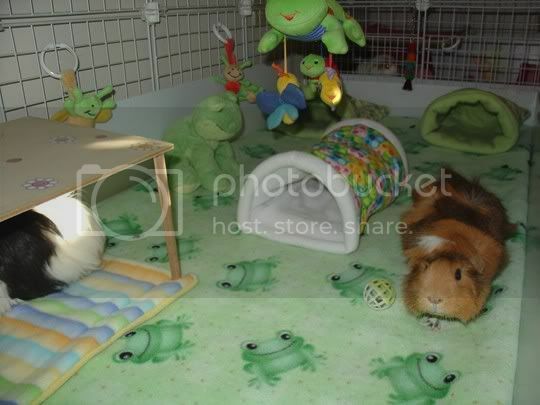 I know I am not the easiest customer in the world :P I appreciate you taking the time to help me make my piggies' homes as cozy as possible. I too sometimes put in special requests and reap the rewards of Windespirit's expertise. I bought a lot of fleece at one point and was going to sew it but then decided that I had no time to do so. 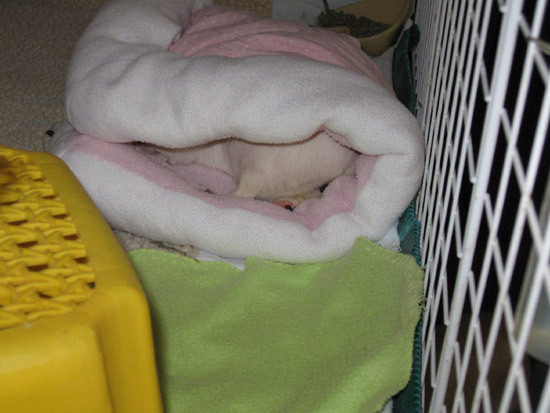 I sent the fabric to WS and ended up with lots of pads that are well loved by the pigs here. From the looks of the photos it looks like the special-needs pigs get first dibs on them. 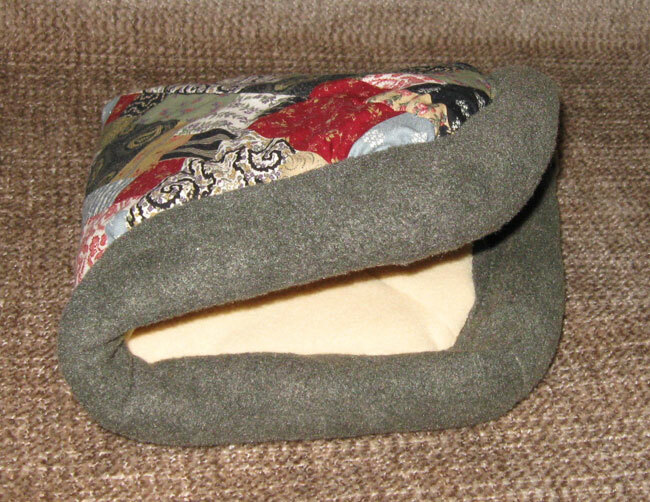 Below are some satisfied customers who enjoyed their fleece pads and tunnel as much as I do. Bugs Mom - the canopy's are not available right now. I'm slowing trying to improve their design and quicker construction on them. 7-8 hours to make one was just a bit much! The Igloo's may actually turn out to be a new layout of Canopy's and have 3 open sides instead of 4, but we shall see. Piggy sandwiches, hehe, just add some lettuce and veggies for a perfect afternoon snack! 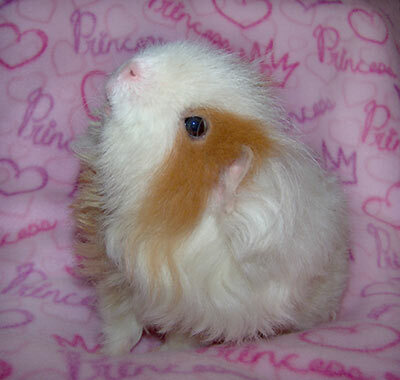 (for the piggy that is). I was thinking the other night a way to have fun. Put one in each corner and play piggie pool. To play is to guess which pig went to which corner pocket when something is going to happen you know will make them run and hide, like when door bell rings or the dog barks. It's a slight entertainment anyhow. Thank You Marsha! 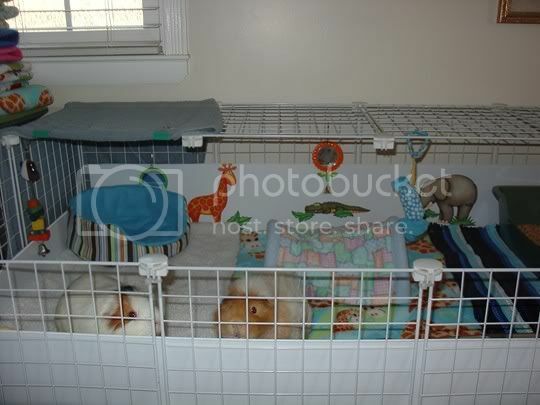 As always I am in aww of your babies and their tidyness ;) I'm happy I could help you and the piggies enjoy other comforts. It is a hard life being a piggie after all. Now Hopkins and Spencer, you know you are encouraged to come live with us, and you could have as many tunnels as you like. The last one is so cute with his paws just so. 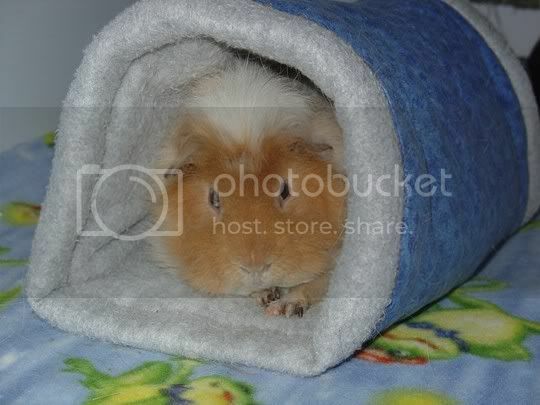 Dudley looks like he's stating he's claimed that tunnel as his! I love the herds green and frogs theme. 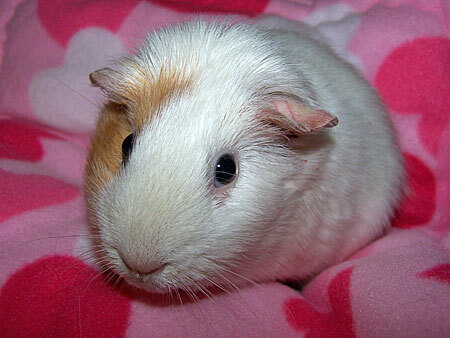 GuineaPigFun - I sit here and smile and remember some of the conversations we had. Did Rosie ever find another spot she liked to lay in? It was a great joy to hear how she took to the tunnel. Jasmine, such a pretty lady, I'm sure you still miss her greatly. Thank you for sharing. RavenShade - Funny you say that, I was just looking at a picture of your tunnel yesterday when I put a hard cover book on it. How's the bed doing? Still bringing some luck I hope. Did Rosie ever find another spot she liked to lay in? It was a great joy to hear how she took to the tunnel. Nope ... the spot of choice was: tunnel or tunnel or tunnel. ;) BTW, did you get my order request that I sent in this weekend? I don't see them "sold" on your website? (tunnels and a corner pocket) Let me know; I'll resend the email in case it didn't arrive. Thanks. Weaver, How in the world did you do that froggie set up? That is the cutest thing I've ever seen. I have absolutely no talent whatsoever when it comes to "decorating." 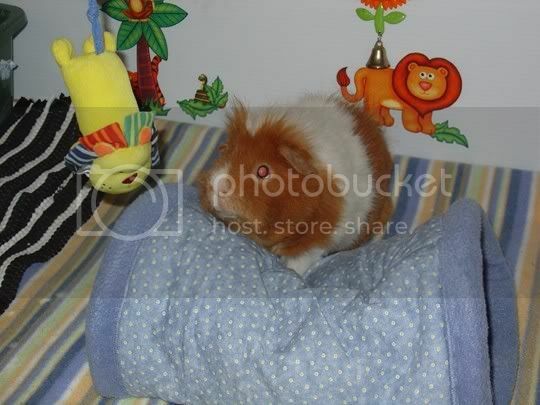 Don't the piggies eat the stuffed animals? What about that little cat toy? Don't they chew on that and eat the plastic? What size C&C is that? Will you come to my house and make one for me? OK. Maybe not. Weaver, I know you've been asked this before. Where did you get the cute hanging animals in the cage? I've been looking everywhere for them and can't find them. Man alive, that Reba is cute! Elvis and Fiona just got corner pockets. Fiona and Kumar think they're great. Elvis still isn't sure if it's going to attack him. GPFun - No I had not received a e-mail from you. You may still have my old comcast address from before our move. I'll send you a message with the new e-mail address. CS8 - hurray they arrived! I bet Elvis will learn quickly how to get mom to feed him while he's in there with that charming personality of his. Windespirit, I had seen on your website that you needed batting for rescue beds....do you have some beds to complete if someone made a donation to you? Could we just make a money donation for you to pick up batting instead of mailing the batting itself (seeing batting is so bulky)? Yes Weaver I do have cotton and fleece donated materials waiting on batting. I know there's at least 5 tunnels and pockets that are already cut for sure, I've barely been able to touch the other 15 gallon box yet from the move and I know that has pads and tunnels already cut, I've forgotten what else in in it. Hey, maybe you might you have some extra time? *grins* I'll e-mail you. No, I don't have the extra time ;P I am still sewing rescue beds myself. I had just thought that if you needed batting I could send you some money to pick up a bag. I know the rescues are REALLY in need right now with the weather being so cold and the drop off rates so high. Oh well, worth asking anyhow, just toss that e-mail out. But yes, batting donations would be a huge help to get things out much quicker to rescues. I'm letting you take care of the beds, but I'm still making pockets, tunnels, and pads for sure. Please use in the subject line "Rescue Donations". I can guarantee anything from now to March will go completely to batting and shipping things to the Rescues. Windespirit, I wrote back to you.